In August of 2011, Glenmary Home Missioners formed the first Catholic Church in Union County, Tennessee. As a part of this formation, local Catholics would gather at the Senior Center with the first mass being held under a carport, being a “bring your own chair” event with twenty-six people in attendance. The group began to search for a rental location to house their church, meanwhile the first Sunday Mass was held in October 2011 at Miller’s Chapel United Methodist Church. Masses were held there for the month of October while the storefront property on Maynardville Highway was renovated. The first mass in this facility was held on the Feast Day of All Saints, November 1, 2011. On December 12, of the same year, the first Mass in Spanish was held along with weekly Spanish Masses beginning on the first Sunday of January 2012 with twelve people in attendance. Growth during the first year of existence was rapid with the formation of a parish and financial councils and a vibrant faith formation program. During 2014, discussion of a permanent church began and a building fund was established. A year later, the community was elevated from a mission church to a parish by Bishop Stika. The Catholic Foundation of East Tennessee purchased land on behalf of the St. Teresa of Kolkata Catholic Community later that year. A major milestone was completed in a short time. During this time, the rental space was used at maximum. 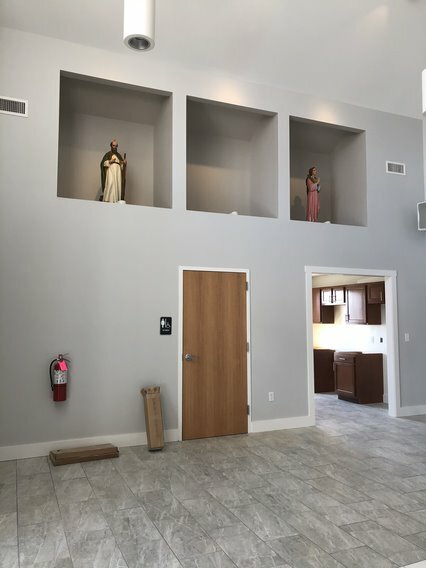 Architects were then hired to create a master plan which was approved by the Bishop in 2016, and the architectural plan for the first permanent Catholic Church in Union County was completed. In September 2016, Blessed Teresa of Calcutta was declared a Saint and the church officially became St. Teresa of Kolkata Catholic Church. Besides these steps of physical growth, the church has been engaged in a variety of community, social, and outreach programs over the years. Many folks have received their sacraments, from baptisms, first communion, confirmations to weddings, as well as several funerals, with growth in faith formation programs every year. Construction of the new church was not only exciting for church members, but also to the community. The structure is located across the highway from Union County High School and has a great beauty to those passing by. As the construction phase nears, each delicate finishing touch adds beauty and respect. Upon entering the church, there will be a statue that was obtained from the old St. Mary’s hospital that has recently closed. The statue of Jesus Christ with his arms raised will be a symbol or greeting upon entry with a portrayal that “You are loved by God.” As spectators enter the double doors at the front of the church, their first steps are into the foyer designed with high ceilings and cutouts overhead to display patron saints. Patron saints, in a sense, represent friends in Heaven that can be asked to console us in prayer. All Patron Saints are models for Christian living and have been assigned different roles. The statues may rotate as time passes to represent different folks. The new facility seats 250 attendees. Many pieces throughout the structure have a past representation elsewhere. For instance, the flooring used in the sanctuary a was retrieved as pews from the Sacred Heart Cathedral in Knoxville. Brother Joe Stein whom is a full-time missioner, is the craftsman behind this transformation of the 100-year-old planks. The floor was the last major project before completion of the church building itself. Outside, a mobile unit is being transformed into classrooms and an office with the addition of a deck. All work has been donated labor from the parishioners. A grant from the St. Mary’s legacy foundation has paid for the materials to complete the office. 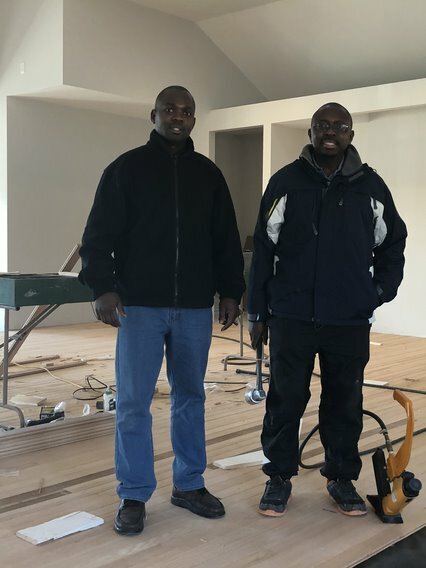 There has been a combination of work from subcontractors and general contractors, three of them being parishioners (brick layers, framers, and siding). The floor was done by the parishioners as volunteers. 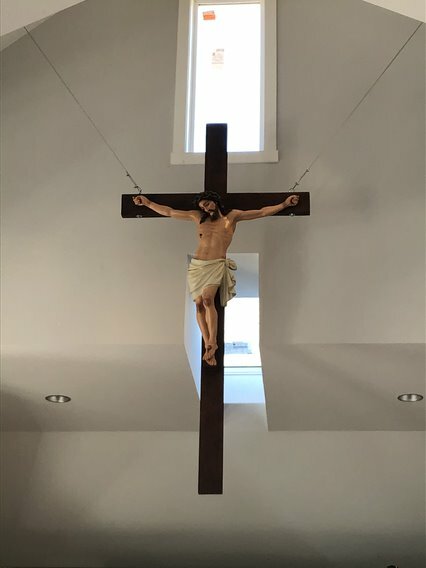 The Queen of Peace Church of Cincinnati came down with other churches for three different weeks and assisted with framing and other work that needed completing. All the inside finishing has been the work of the parishioners which is how they have been able to help keep the cost down. It has been a more expensive project than originally thought; however, it seems that most construction from the ground up does have that affect. In the future, the church hopes to have a bell tower, but that is another extremely expensive item that will be a project for later along with the paving for the parking area. Some paving and cement has been completed to meet the qualifications for fire code and compliant parking. Local Boy Scouts plan to create a nature trail. Also, there will be a playground, and the youth want to put in a nine-hole Frisbee disc golf. The nature trail, disc golf, playground, and eventually, in the long-range plan, a soccer/sports field will all be welcoming to the community. Services will be held on Sundays with 9am being English and 11am Spanish, and Wednesdays with bilingual at 6:30 followed by k-adult services including English and Spanish in the adult classes.